How to Negotiate Ciampino airport, Rome. Here's what to expect at Ciampino, and how best to deal with it. 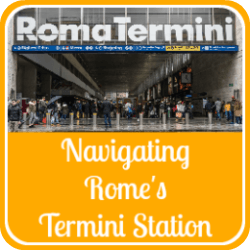 Looking for information about Rome's Fiumicino International airport? Click here! It's officially named "G. B. Pastine International Airport" - but no-one ever calls it that. It's always just known as "Rome Ciampino" (pronounced "Cham-pee-know"). Opened in 1916 and now handling most of the low-cost European airline flights into Rome, Ciampino is one of the busiest in the whole of Italy, processing nearly six million passengers each year. It's not a large airport by any means, and that many people passing through inevitably means it's going to be busy. At times it can be not just busy but incredibly congested, hot and unpleasant. You can get through it with the minimum of stress - you just need to plan ahead. General Information about Ciampino airport. 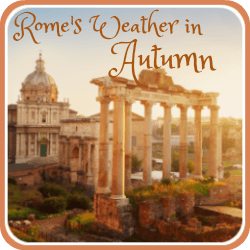 Situated 12 kilometres (about 8 miles) from the centre of Rome, Ciampino is just off the main city ring road and very easy to reach by car. Its position also makes flying into Rome one of the best airport approaches in the world. If you're on the right side of the aircraft you'll see the city spread out underneath as you come in to land. Seeing sites like the Colosseum and St Peter's Basilica from the air is breathtaking no matter how many times you do it - and we've done it a lot! Coming into land at Ciampino airport. 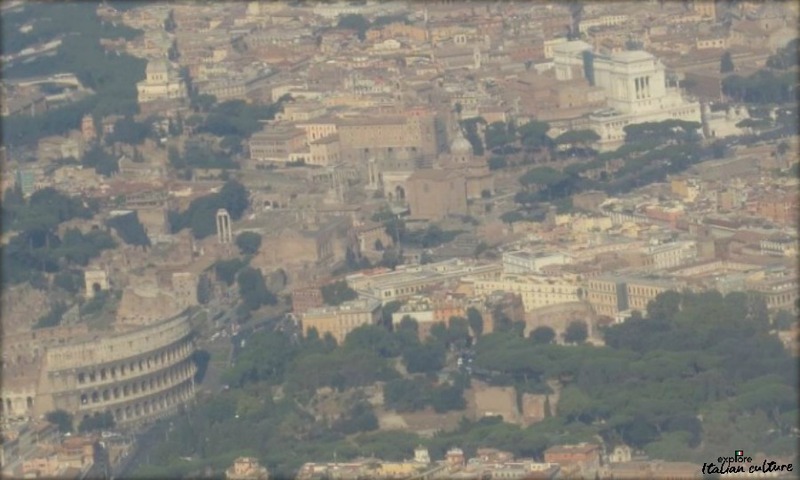 The Colosseum, Forum and Piazza Venezia are all easily visible. To get the best view if you're flying in from northern Europe, try to get a seat on the right-hand-side of the plane as you stand in the aisle facing the cockpit. You'll see the most from there. Leaving Rome isn't so spectacular as the planes take off away from the city centre. We have separate sections of information for you depending on whether you want to know about arriving in or departing from Ciampino. Click here for arriving and here for departing. 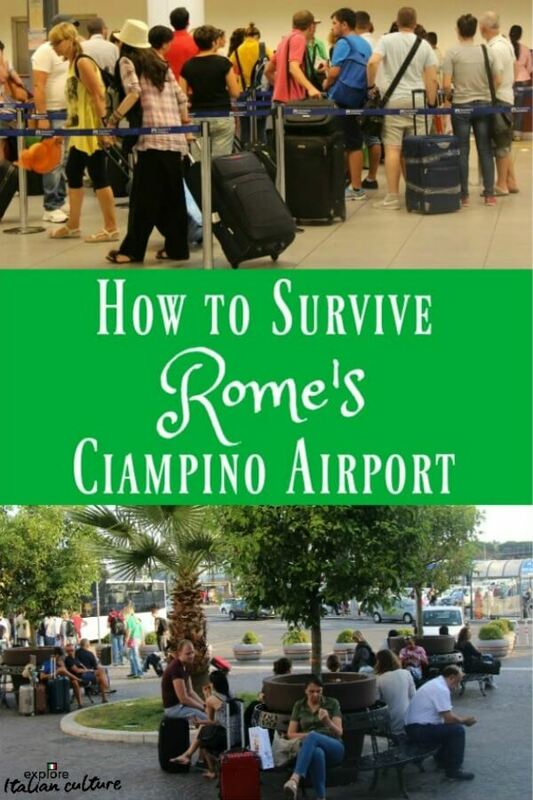 How to get from Ciampino airport into Rome - and back. The rather unprepossessing frontage of Ciampino airport, Rome. 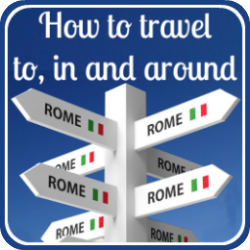 It's pretty easy to get from the airport into Rome - and vice versa - and there are a number of different ways of doing it ranging in price from very inexpensive to more costly. 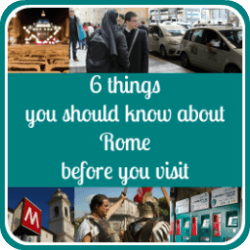 Click on this link to go to a page which will give you very detailed information about the travel options from Ciampino airport into Rome. It will open in a new window so that you can come back here and plan the rest of your time in the airport. If you need assistance at Ciampino, either arriving or departing, you need to book it through your airline at least 48 hours before your flight. 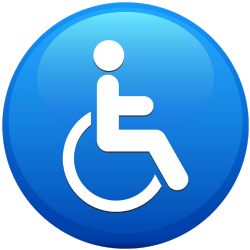 We've had experience of this (Cath's elderly mother has flown into and out from Ciampino several times) and generally speaking the wheelchair service is efficient and friendly. Public facilities at the airport, such as doorways and washrooms, take special needs into account. Unfortunately wheelchair users won't find shopping at Ciampino such a good experience - aisles are narrow and goods often squashed together to make use of the limited available space. As you would expect from a major city airport, signage is international - it's in both Italian and English and the important parts of the airport like passport control, toilets, transport and the exit use the usual worldwide icons as well as text. Some staff speak languages other than Italian but you'll find that those working in the shops and caffès are very limited in the amount of English they can speak. Nevertheless, staff here tend to be very friendly and accommodating - and asking for a cappuccino is the same in any language, so it's really not a problem. Perhaps surprisingly, passport control is relatively efficient at Ciampino. Although the lines can look very long, particularly if several flights are arriving at the same time, they move very quickly. That's largely because most arrivals at this airport are from within the European Union where border control is unecessary. EU passports: Are likely to get through passport control within, at most, fifteen minutes. Passports from outside the European Union: Will need to fill in the usual immigration forms and go to a separate queue (line). As there are relatively few arrivals from outside the EU though, even this process won't take long. Count on no more than thirty to forty minutes - as long as there are no issues with your security, of course. Collecting luggage and going through customs. The arrivals screens will tell you which carousel your luggage will arrive on. This process can take some time, depending largely on how far away from the terminal building your plane landed. Customs is again generally very quick given that most passengers are travelling within the EU where customs checks are now more or less non-existent. Nevertheless, officials are always on duty and will stop passengers at random to check luggage. The arrivals hall after security is tiny and has very few facilities. There is an American Express currency exchange booth which is - usually - staffed, but as with any airport the rates are not good. Far better to make sure you order your cash before leaving for your trip. If you have a 'chip and pin' card you will find cash machines (ATMs) in the departures building - there are none in arrivals. 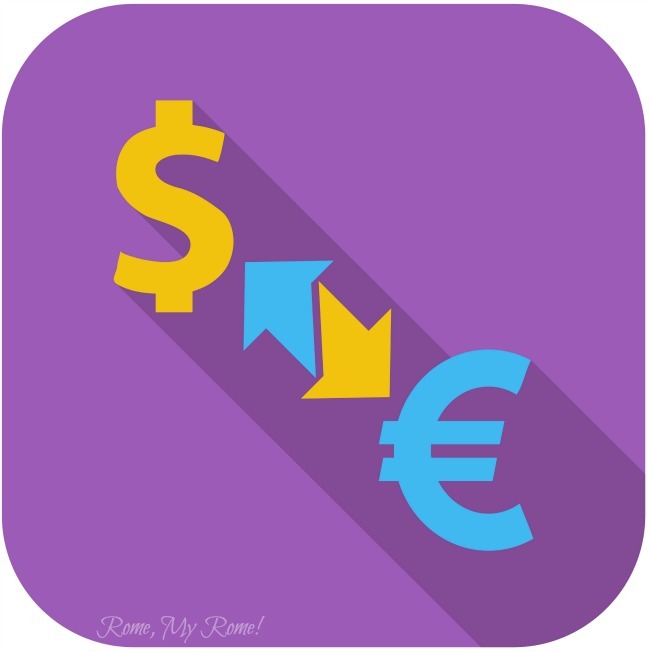 But beware : you will only be able to withdraw a maximum of €250. If you try to withdraw more, you won't be able to and your card may be kept or your account frozen. So again, plan. If you're flying into Ciampino, get some Euros before you travel. 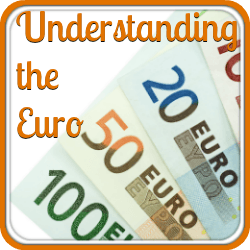 If you arrive without any and you need more than €250, use the currency exchange desk - but be prepared to pay for your lack of planning. 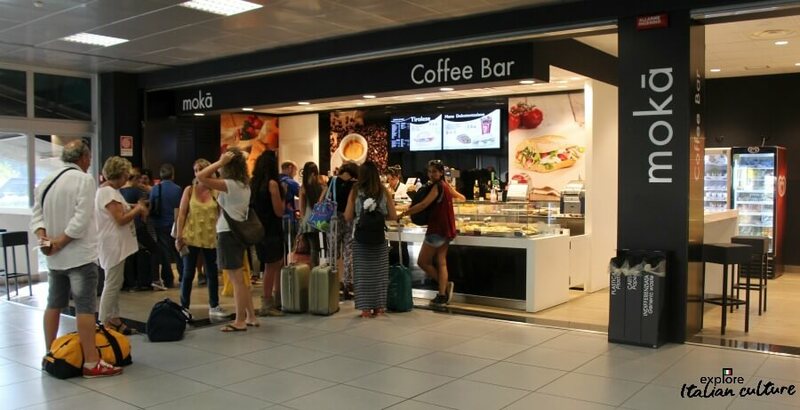 There is a coffee bar in the arrivals hall at Ciampino which is open between 6am and midnight, serving reasonable coffee and sandwiches if you want to take something with you on your journey into Rome. Be aware though that service can be slow and the lines, long. The coffee bar in the arrivals building at Ciampino. 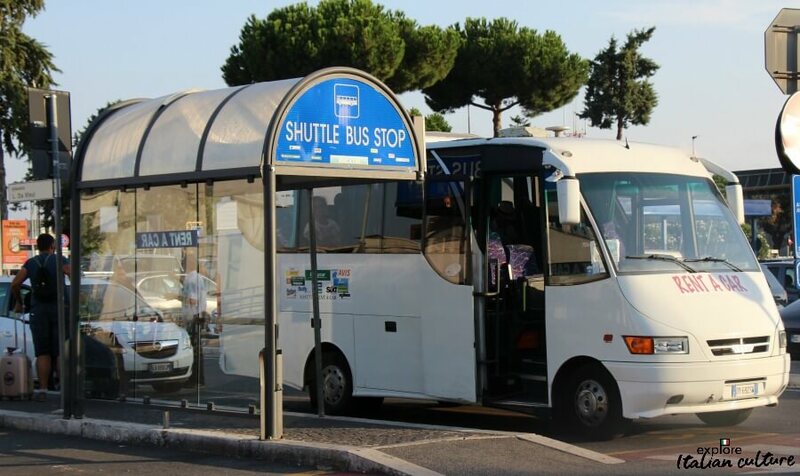 Links between Ciampino and the city are reasonable and inexpensive, particularly if you're prepared to travel by coach. The booking office for Terravision, the most well known (and in our experience, efficient) of the coach transfer companies is directly outside the arrivals doors as you exit security. 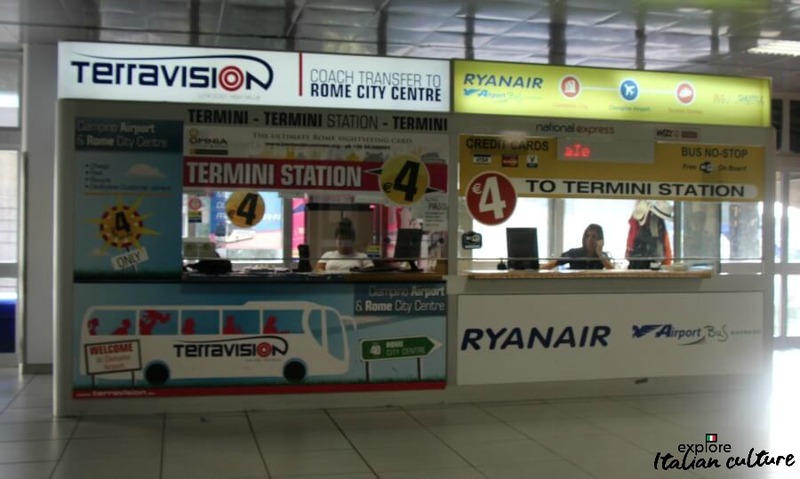 The Terravision booth at Ciampino. Please note - prices have gone up since we took this photo. 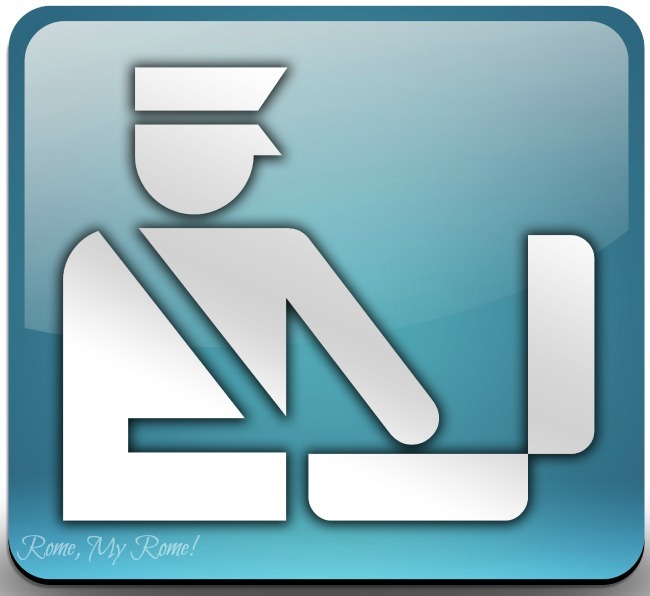 To avoid lines when you arrive at the airport, you can now book your Terravision ticket online. Taxis are to be found immediately outside the arrivals hall and the buses, straight ahead and then to your left. Be careful to agree the price before you travel. Rome taxi-drivers are not averse to charging more than they should. Although the price is on the side of the car, for example, they will sometimes try to tell passengers the rate is per person. It's not - it's for a car load. 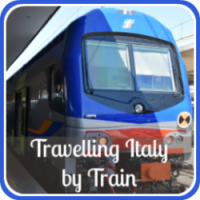 See our page with more details about different ways of travelling into Rome, at this link. Taxis outside the arrivals hall of Ciampino airport - agree a price before you travel! There are, of course, many car rental agencies based at the airport, but none of the offices is based in the arrivals hall. 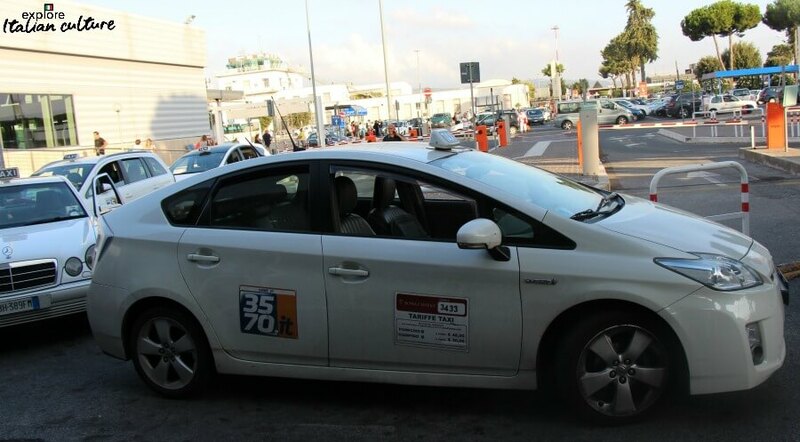 You need to go outside the terminal building and find the car hire shuttle which, no matter which company you've booked with, will take you to the rental area which is in tucked-away car parks about fifteen minutes' walk from the arrivals hall. If you're renting a car, look for this shuttle stop outside the departures hall. However, our warning about driving into Rome is the same from Ciampino as from Fiumicino (or anywhere else) which is - don't do it! If you have an onward journey using the ring road that's fine, but driving in the city is chaotic and parking nigh on impossible - and very expensive. Take our advice - use public transport or book a private transfer instead. 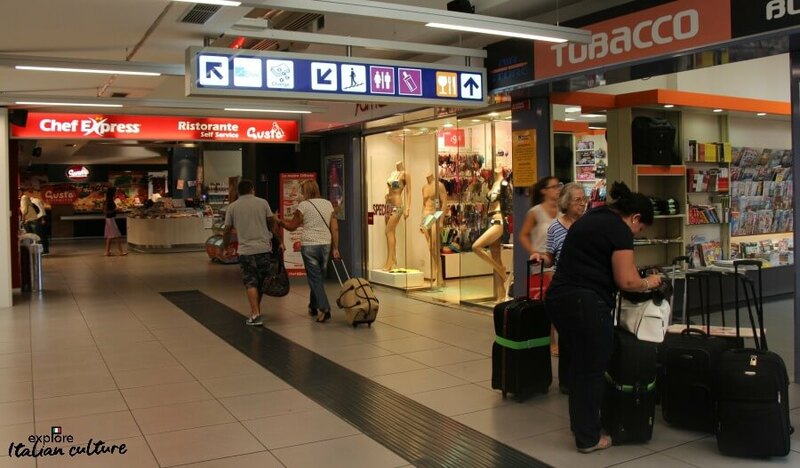 The departure terminal at Ciampino is far less chaotic than its sister airport, Fiumicino, but nevertheless, depending on the time of day you're travelling and how many other flights are leaving at the same time, it can be very busy. 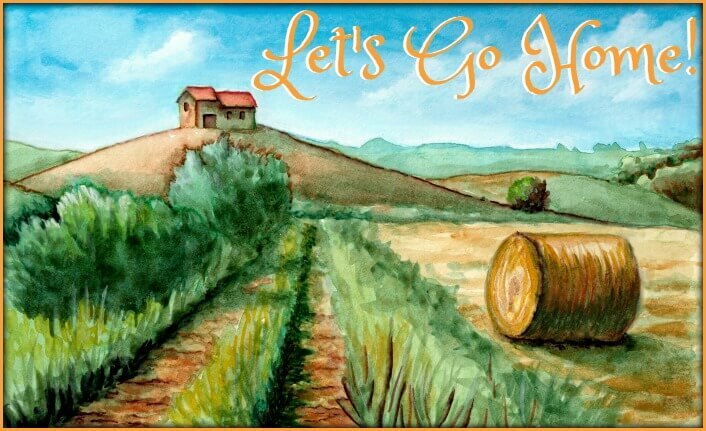 Don't be lulled into a false sense of security because your arrival was painless - departing is a whole different ball game. Getting back to the airport from Rome. As with arrivals, there are several transfer options available depending on your budget. If you haven't done so already, take a look at the five most popular ways by clicking on this link. One of the most important things to know about Ciampino airport is that the departures area closes between midnight and 4.30 a.m. If you're planning on arriving early and sleeping in the departures hall, you won't be able to. Your only option will be to go to arrivals - where there are very few chairs and no coffee bar until 6am - or to sit outside, weather permitting. Actually, sitting outside until you absolutely have to go in is quite a pleasant option anyway. There are trees, a bit of grass and a few areas to sit and relax. 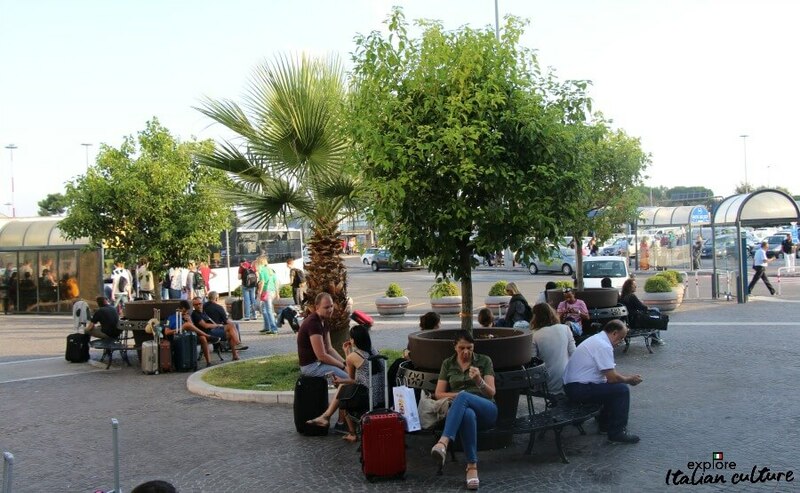 Outside the Ciampino departures hall - a pleasant sitting area but a limited number of seats. 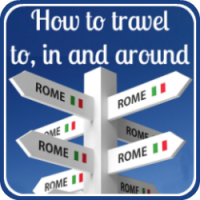 Checking in at Ciampino airport: When to get there. There is only one departure terminal at Ciampino so you don't have any problems about where to go to. Once inside the departures building you'll see the check-in desks ahead of you. If you have an EU passport, have checked in online and are travelling with hand luggage only there is no need to use the check-in desks at the airport. Go straight through security into the departures 'lounge'. Our advice is to do this wherever possible because the check-in desks are not known for their efficiency and queues (lines) can be very long and very slow. 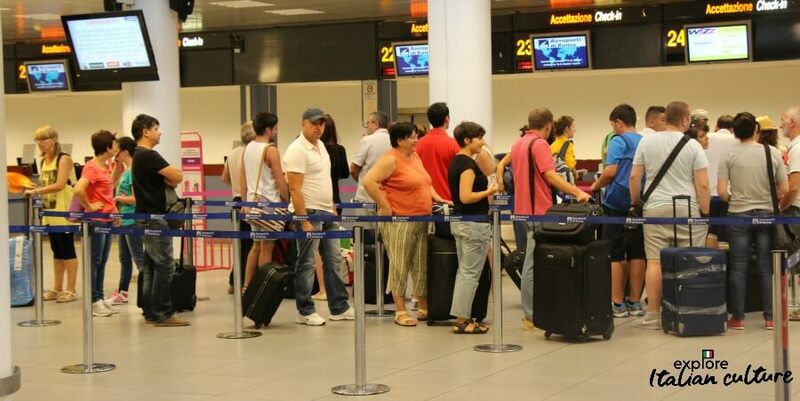 A quiet day at Ciampino's check-in - it's not always like this! Other passport holders, and all those with luggage to be checked, have to go through the torture of desk check-in. Plan to arrive at least 30 minutes before the check-in and bag drop opens to make sure you get a good place in the inevitable queue. And don't be surprised if your check-in desk doesn't open until 30 minutes or so after it should. Don't leave checking in until the last minute. You may be lucky, but it's not unusual to find lines snaking through the departures hall and outside the terminal. Once you've checked your bags in (if you have bags to check), you'll be directed towards passport control and security. As you approach you'll see a newsagents / gift shop, a lingerie shop and a large-ish self-service 'restaurant' caffè bar. These are the only eating and shopping facilities before security. However, the gift shop is expensive (although it does sell non-Italian newspapers) and the self-service food is not great, so our advice would be to skip both these things and head straight for the security section. Because this airport serves mostly European Union destinations, security and passport control is nothing like as chaotic as at Rome's other airport, Fiumicino. The security lines can be long but they move quickly and with surprising efficiency, even if you have a non-EU passport. You need to allow at least an hour before your flight leaves to get through passport control and security, and out to your gate. It will probably take far less time than that but it's better to err on the side of caution. Facilities on the other side of security. You'll find some shops on the far side of security including a fairly large 'duty free', some expensive clothes and accessories shops and a small coffee bar called 'Mr Panino' which makes delicious, fresh sandwiches. The main complaint about Ciampino airport - and it's a very valid one - is the lack of available seating airside. Unless you're very lucky you'll need either to stand or to sit on the floor. 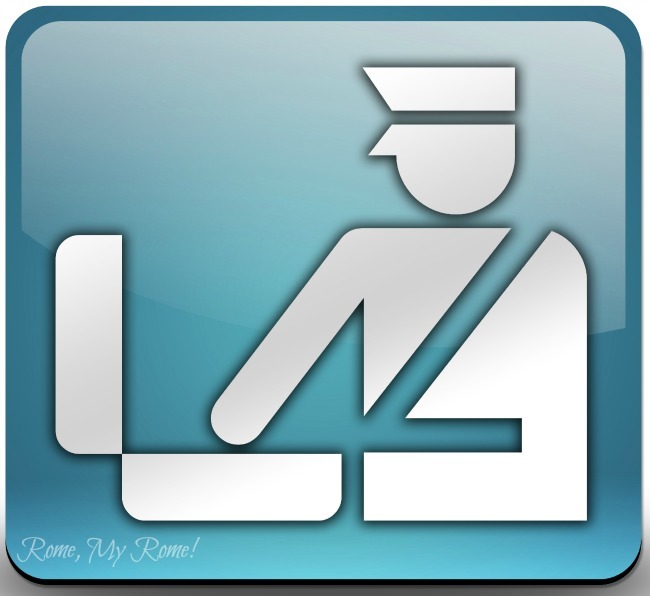 The 'Aeroporti di Roma', who manage the airports, has recently introduced "free and unlimited" wifi access throughout Ciampino - a great advance on the complete lack of internet access until now. It's often very slow, though, and you'll need to register using your name and email address. It can be a long and tedious process. Be prepared. Take a book. There is a website for Ciampino airport which provides details in English and has arrivals and departure boards. Follow this link, which will open on a new page. If you found this information helpful, we'd really appreciate you clicking this little button. Thank you! Some other information you may find helpful. Click on the pictures to go to any of these pages.